Dwayne "The Rock" Johnson's schedule is non-stop. Over the weekend, he wrapped up a press tour for his new comedy Central Intelligence just after concluding production on the Baywatch reboot in Georgia. Around the corner is the season two premiere of Ballers and way down the line Johnson will star as Black Adam in Shazam!. Next up, though, is Fast & Furious 8. The eighth installment of the Fast & Furious franchise recently began production in Cuba but Johnson has yet to hit the set. That said, his character will still be featured more in the upcoming addition to the franchise than he was in Furious 7 according to the film's producer, Hiram Garcia. Garcia, credited as as a consulting producer on Furious 7 and will stay involved for Fast & Furious 8, is excited to head down to the Atlanta set later this week. Though he hasn't been to set yet, he has been working hard on perfecting the role Hobbs will play in the movie which hits theaters in April of 2017. "I've been in the mix with Chris Morgan, the writer, really dialing in the Hobbs character, which is one of our all-time favorite characters," Garcia tells ComicBook.com. Garcia, Johnson and Morgan co-created the Hobbs character so it's no surprise Garcia and Johnson are looking forward to bringing him to life again. "Hobbs was one of the first characters we merged together on and when Fast approached [Dwayne Johnson], telling him about the character they wanted to create, [Dwayne Johnson] and I were able to sit down and craft this guy that we would just laugh out loud at the lines we would come up with. When you can say you're gonna put a hurt on someone so bad you'll make their mama wish they kept their legs closed, stuff like that where we can't even finish the line before laughing - that's the fun we love." "I love coming back into this space," Garcia says before calling the Fast & Furious franchise a "juggernaut." As for Johnson's role in the film, Garcia sounds excited to admit that it will be larger than the last time we saw Hobbs in (or out of) action with Furious 7. "On the last movie, due to schedule restraints, we were only able to play on it for a couple weeks," Garcia explains. "In this one, we're really spread throughout the movie, so it's great to be back up here and we'll be back on set on Wednesday." 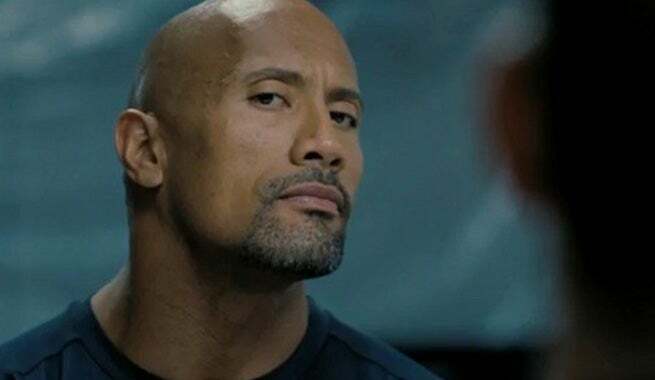 Do they love the character enough to make a standalone Hobbs movie starring Dwayne Johnson? "A hundred percent," according to Garcia. "I think there's always been conversations for that. The scheduling of it all is a challenge but there are always talks about a potential spinoff movie and what we can do with it. DJ and I were just talking about that the other day - our visions for it. There's a real goal for that and we can have enough fun with that where we've earned that now with the audience. He's a beloved enough character that they'd love to see what a ride with him would be like in his world. We have tons of history that we've crafted for this guy that we continue to sprinkle in throughout the movies. You'll see a little bit more in this movie but ultimately we want to take that ride and spin him off and have some fun with it." Fast & Furious 8 is set for release on April 14, 2017.